The band standing on the steps of the Glasgow Royal Conservatory in Glasgow, Scotland during the 2015 World Pipe Band Championship trip. The Midlothian Scottish Pipe Band practiced for the first time in January of 1975. Pipe Major Ian Swinton and Leading Drummer Jim Sim had a different philosophy regarding pipe bands in the Chicago area; Midlothian wanted to be a highly competitive band at a World Level. The first goal was to start a teaching program for young people so the future band would have the same playing philosophy. The band was helped by the village of Midlothian, a south suburb of Chicago. The first practice hall was the Midlothian public works garage. During the first practice the snow plow trucks were driving into and out of the garage; not the best of conditions. Midlothian started as a Grade 4, first competing in Alma, Michigan where the band finished 3rd. During the first year, in addition to Alma, the band traveled to Canada and Pennsylvania to compete. The practice hall was then moved to a school in Midlothian which was much better for everyone. The teaching program was moved to the Midlothian Park District which also helped. In 1976 the band won the Grade 4 contest at Alma. In 1978 the band was upgraded to Grade 3. Now, several of the young players that were being taught were ready to enter the band. The band continued to advance into 1981. During this year the band entered 10 contests and won all 10. These included the U.S. Open, the Canadian, the North American, and the overall season honor of the Grade 3 Ontario Champion Supreme. In 1982 the band was upgraded again to Grade 2. In 1983 the band planned a 3 week trip to Scotland. By now the band also had a Juvenile Band that played in Grade 4. 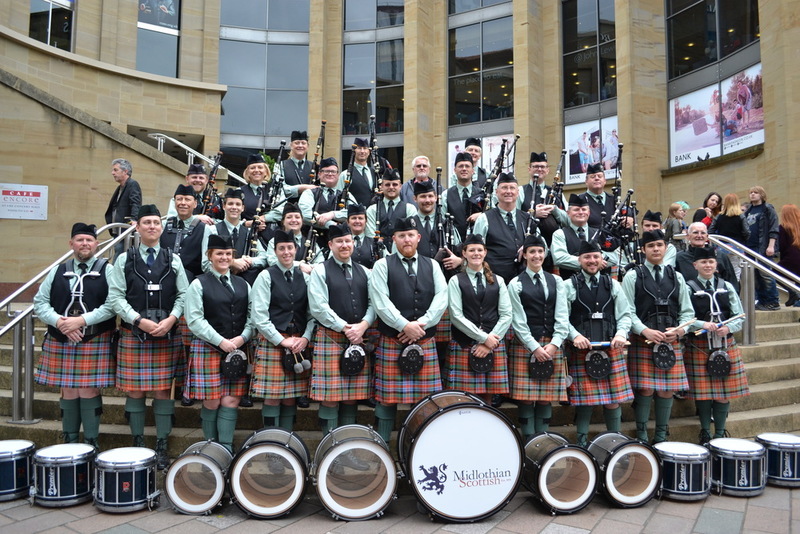 Both bands and a group of over 100 people went to Scotland for 3 weeks and 5 contests including the World Championships and the Cowal Championships. The band was awarded the best overseas band at the World Championships and finished 8th at Cowal. The band also finished 2nd at Rothsey, and 3rd at Perth and Edinburgh. The band also had the honor of playing in the City Square in Reykjavik, Iceland. 1984 saw another successful year as the band won the U.S Open, Canadian, and the overall Grade 2 Ontario Champion Supreme Award. This was the first year the band played special customized Ludwig drums that were fitted with special top snares that were designed and built by the band. These drums were played until 1988. The band was upgraded to Grade 1 in 1985. This filled a goal of Ian and Jim’s to lead a band from Grade 4 to Grade 1 in 10 years, done almost exclusively with players that were home grown in the band. The band also made their first album in 1986. This was done with the help of the Illinois St. Andrew Society. After the 1987 season the band lost several players and went back down to Grade 2. The band then decided to travel to many different venues including Santa Rosa, California, Orlando, Florida, and of course the usual contests in the Midwest and Canada. In 1990 the band traveled back to Scotland for the World Championships and the RSPBA Diamond Jubilee. The band finished 8th at the Worlds and 4th at the Diamond Jubilee contest. After this trip the band again went on a rebuilding program with good success in the Midwest and Canada. 1996 saw the band travel again back to Scotland this time finishing 6th overall. The band also won the best bass section award. During the late 1990’s the band traveled again to Pleasanton, California and Scotland several times with good success. In 2001 the band lost several players and merged with the Chicago Metropolitan Pipe Band under the Leadership of Pipe Major Bob Boyle and Leading Drummer Marty Boyle. The band dropped down to Grade 3 as only some of the Midlothian players merged. The band won the Grade 3 North American Championship and was second at the World Championships in this year. The band then to Grade 2 in 2002 with moderate success. 2003 saw the band take the season off from competitive action for the first time in its history. Following this break, Pipe Major Ian Swinton decided to return for the 2004 season and this breathed new life into the Midlothian Scottish Pipe Band. The band returned to the competition field again in 2004 placing in several contests. In 2005 the Midlothian Scottish Pipe Band again played a full schedule including 2 trips to Canada. The band finished 2nd in Chatham, Ontario, took 5th at the North American Championships, and 4th in Montreal. The band just got better and better as the year went on. Following the successful 2009 season, which the band concluded by placing 2nd again at the North American Championships in Maxville, remaining original members of the band decided to retire. These members included Pipe Major Ian Swinton, Leading Drummer Jim Sim, and Drum Sergeant Keith McDonald. With this drastic change in leadership, the band closed its cases for what it thought would be the last time. In 2011, though, members of Midlothian Scottish began discussing a return of the storied band. With the phrase “Midlothian is Back” passing throughout the Midwest, the band returned to the circle under the direction of Pipe Major Evette Miller, daughter of founding member Ian Swinton, and Lead Drummer Adam Rusek, nephew of founding member Keith McDonald, for the 2012 season. Winning various contests throughout the Midwest, the band had a successful first year back. The Midlothian Scottish saw their second year back in competition to be even more successful than their first, winning the Grade 3 MWPBA Champion Supreme in 2013. Following the conclusion of the 2013 competition season, Pipe Major Evette Miller and Drum Sergeant Adam Rusek stepped aside from their roles as the band welcomed Tristan Wilson as the new Pipe Major and Andrew Watson as the new Drum Sergeant of Midlothian Scottish. The band continued to see improvement and success in recent years, including Champion Supreme for Grade 3 in 2014 and 2015. The band once again took a successful trip to compete in the World Pipe Band Championship in 2015. This trip included a performance in George's Square for the Piping Live! Festival. The band made it into the finals taking 1st place in piping and 3rd overall in their qualifying round. For the 2016 season, the band was once again moved up to Grade 2 by the MWPBA due to a consistent high standard of play and several nearly undefeated seasons. For the 2017 season, the band was welcomed as a Grade 2 member of the RSPBA for the 2017 World Pipe Band Championships. We invite you to visit our social pages to keep up to date on the current competitive season.